Depth maps allow software to recognize the distance of objects from a camera, thus making it possible to show text floating between objects for example, or simulate a 6DOF effect. Previously, only high-end 3D 360 cameras such as the Yi Halo or GoPro Odyssey could generate a depth map. 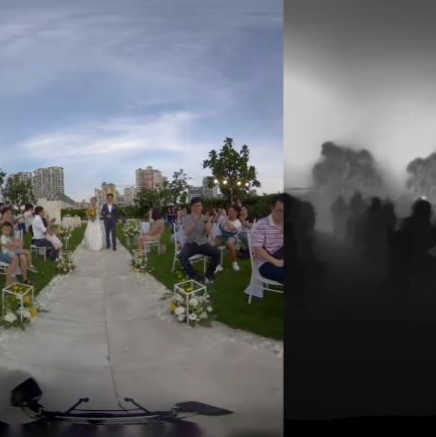 But Kandao has now released a new version of their stitching software that can generate a depth map from a 3D 360 video or photo from any of their cameras: the high-resolution Obsidian R, the high-speed Obsidian S, or the affordable Obsidian GO. Here is a sample depth map from a top-bottom 3D 360 video. The depth map is in .exr format. In addition to exporting a depth map, the new stitching software also has a new depth-aware stitching mode in addition to its high quality stitching mode which is based on optical flow and AI. According to a Kandao representative, the high quality mode would be better for 2D output because it is faster. It may also be better for simpler stitching, where there are no challenging stitching situations. But for a good stereo effect and/or for using a depth map for special effects, they recommend the depth map stitching mode. What do you think of this feature? How would you use it? Let me know in the comments!